The Professional Philanthropy Network is hosting its January Happy Hour in support of USO Central Florida! Kick off the New Year by celebrating our military at World of Beer on January 18th! 100% of the proceeds go to our local service members and their families through USO Programs and Services. Appetizers with their $10 donation. Don’t miss out on raffle prizes like SeaWorld tickets, a TV, and more! Network with current and potential members! Join WID Greater Tampa Bay Chapter for a networking social and January membership drive! Meet your peers and learn about our upcoming events for 2017! 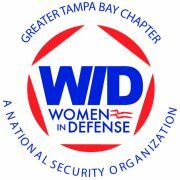 We invite you to join our chapter in strengthening and influencing our defense and national security industry by inspiring women, growing professional relationships, and cultivating the advancement of women leaders in government, military, and industry professions. Our event will take place on the covered patio area of the Tampa Yacht & Country Club.